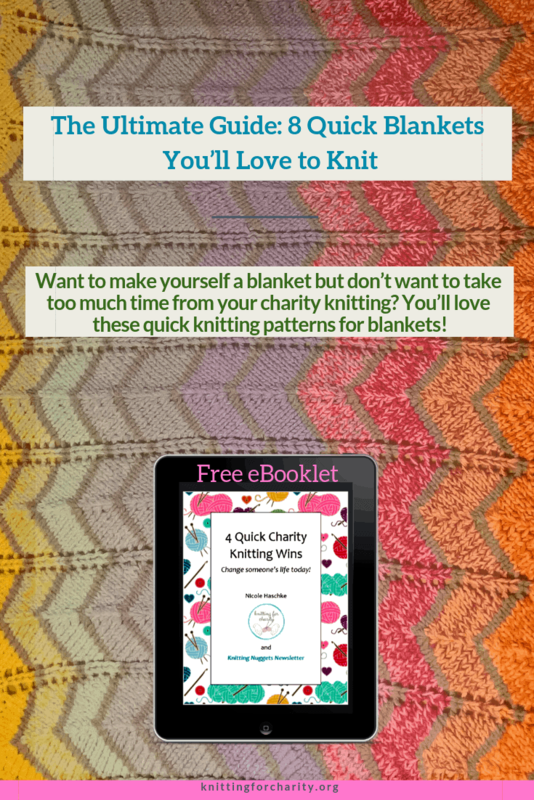 Want to make yourself a blanket but don’t want to take too much time from your charity knitting? You’ll love these quick knitting patterns for blankets! A few weeks ago, I battled a flu virus that the nurse practitioner who tested me told me was “extremely contagious.” It left me feeling like Typhoid Nicole. One example: the morning after my diagnosis, I was sitting on a loveseat and spotted a blanket. I thought, “It would be lovely to curl up with a blanket.” I reached for it, then stopped myself. Because I remembered that this was my younger daughter’s blanket, and I felt like curling up with it would run the risk of “infecting” her with my flu virus. It then occurred to me that every single person in my family has their own blankets. And yes, I do mean that in the plural. Blankets. There’s only one person in my house who doesn’t have her own blanket. Have you guessed who that person is yet? Yep… the one who was afraid of infecting the rest of her family with the flu through their blankets. Is that not ridiculous? I’m the knitter of this family. I’ve made countless numbers of blankets — for friends, for family, even for my older daughter. But I’ve yet to ever make one for myself! But… here’s the problem. This year I’ve re-committed myself to charity knitting. I feel like I didn’t do enough last year, so I’m trying to do far more this year. Knitting a blanket for myself, in the face of this commitment, seems so self-indulgent. Is anyone else out there with me? Do you ever feel like knitting yourself a blanket, or a sweater, or any other particularly lengthy project is terribly self-indulgent, if not out-and-out selfish? It’s pretty silly, really. I’ve knitted plenty of things for myself — hats, countless mittens and fingerless mitts/gloves, scarves, socks, even a couple of shawls. But knitting a blanket seems like it would take far too much time away from knitting things for someone else. The only solution — to avoid my own guilt but to still get myself the blanket I obviously require — was to find quick knitting patterns for blankets that take as little time as possible. So! If you’re in the same boat as I am — realizing that you’ve been knitting blankets for basically everyone but yourself, yet not wanting to take too much time away from knitting for others — join me as I hunt down quick knitting patterns for blankets! 1) No lace. I cannot knit lace quickly. Maybe some people can, but I’m not one of them. So you won’t find any lace blankets here. Sorry! 2) No fringe. I suppose you could leave off the fringe, but every time I try to leave fringe off a project designed to have it, it looks strange to me. I don’t really care for fringed blankets, so I’m skipping the fringe here. 3) An interesting stitch pattern. I can’t handle straight garter or stockinette stitch for a project as large as a blanket. 4) … but not too interesting. I want to be able to knit this while watching “Top Chef,” for instance, or when listening to a podcast or an audiobook. In other words, I want something easy to memorize that I can knit without constantly staring at my hands. So with those in mind, on to the patterns! Quick Knit Blanket: This Red Heart pattern uses nothing but multiple series of knit and purl stitches, stacked in different ways, to create a delicately wavy pattern. Quick Knit Throw: With nothing but slipped stitches and alternating colors, this beautiful Lion Brand pattern creates almost a honeycomb-like texture. 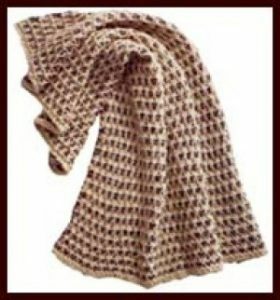 Arm Knit 3-Hour Blanket: So this pattern violates rule 3, because I believe you’ll use only stockinette stitch. But I think the fact that you’ll arm-knit it — a technique I’ve yet to try, though I’ve been curious about it for years — outweighs that objection! Stash Burner: I’m tempted by this one merely because of its name. 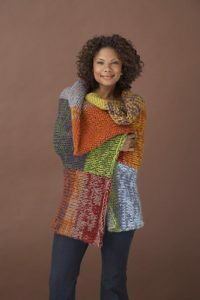 You’ll hold several strands of yarn together to create this thick and quickly-knitted project. The Boulevard Blanket: This is the third-most popular pattern in this collection, and it’s easy to see why. The subtle moss stitch pattern creates a fluffy, warm texture. After perusing the projects tab of the Ravelry page, I’m particularly impressed that it looks as good in variegated yarn as it does in a solid color. Multi-Hued Afghan: This particular pattern is terrific for someone with a ton of different colors of yarn in the stash *cough*. It’s actually designed to use many different colors. Lion Brand has made this pattern available in 2 other sizes; you’ll find links to these in its Ravelry page too. The pattern linked here is the smallest size. Eleventh-Hour Blanket: Wondering which pattern in this collection is the most popular? It’s this one, and it isn’t even close! This is a deceptively simple knit with seed stitch, super bulky yarn, and an applied I-cord edge in a contrasting color. (Though if I ever knit this one, I’ll probably crochet the edge instead because I don’t really enjoy applied I-cord.) 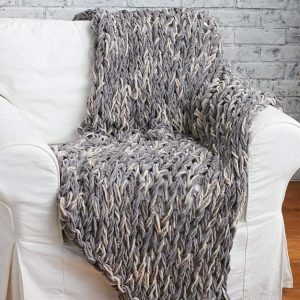 I love the look of this blanket, and it’s definitely in my top 5! So which of these quick knitting patterns for blankets is your favorite? My favorites are the Quick Knit Blanket, Eleventh-Hour, Ziggy, and Boulevard, and I seriously considered the 3-Hour Arm Knit too. As you know if you read my last What I’m Knitting Wednesday post, I eventually decided on the Ziggy Lapghan. 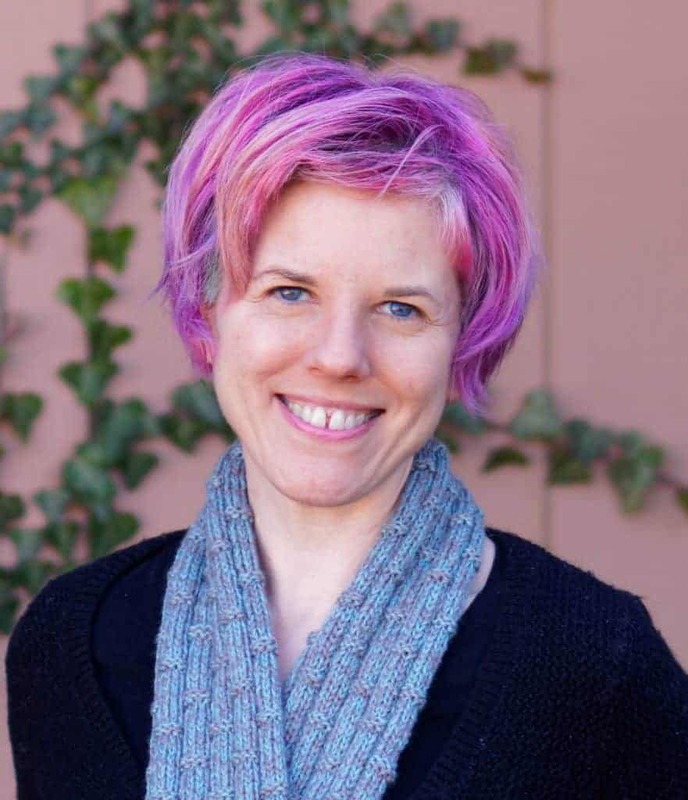 I knitted it in rainbow colors to match my hair. It knitted up very quickly, which was just what I wanted. Yay! Do you need a blanket to curl up with when you’re struck with the plague — excuse me, the flu? Then why not try one of these quick knitting patterns for blankets for yourself? Need Quick Gifts to Knit for Christmas? 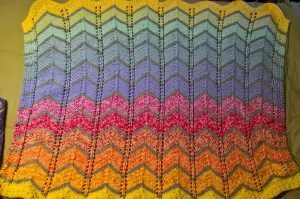 Ziggy is right up there with the “chevron colour-block blanket”…I was inspired by the baby version of the pattern made by, Ravelry member, kylieknits in gorgeous colors of “Spud and Chloe Sweater”.